Many Patriot League football fans remember the 153rd meeting between Lehigh and Lafayette, one that ended happily for the Mountain Hawks. They might remember the MVP performance of QB Brad Mayes, or perhaps the halftime speech by OL Zach Duffy that seemed to spur the Mountain Hawks to victory. Or perhaps they might remember the spectacular single play of Mayes rolling right and finding WR Gatlin Casey in the end zone to give the Mountain Hawks a lead they didn’t relinquish. It was an incredible play by Mayes, who returns this upcoming year for his senior season, and Casey, who, having exhausted his eligibility at Lehigh, will be playing one more year at Middle Tennessee State. As great as those individual moments are, though, they are not my biggest takeaway of that game. Too many Lehigh people forget that Lehigh was down 31-21 at half, and that victory was no sure thing. And they sometimes forget that so much of that victory came from the grinding of WR Troy Pelletier, delivering huge 3rd down reception after huge 3rd down reception, and grabbing the critical touchdown that cut Lafayette’s lead to 31-28. They forget the absolute receiving clinic he put on against Lafayette DB Phillip Parham – himself no slouch – not only by running perfect routes, which he always did exceptionally in a Lehigh uniform, but by using his body to get open and become a bigger target for Mayes. It’s no easy task to make a 9 catch, 107 yard, 2 touchdown day against your bitterest Rival seem like another day at the office, but that’s exactly what Troy did, in his quiet, intense, hard working way. And that’s my biggest takeaway from that Rivalry game. Many may forget, but I do not. And this week, in the run-up to the NFL Draft, we are going to find out which NFL teams have been paying attention as well. One of the more interesting aspects of covering Lehigh football for so long is the fact that you end up seeing future NFL players on their rise to the big show. In fact, two players who squared off against the Mountain Hawks in particular have an excellent chance of being drafted on Day 2 or Day 3 of the NFL draft. But those not the only Lehigh football opponents that will be hoping to get a phone call from an NFL team this Friday or Saturday. Though few Patriot League, Ivy League or even CAA players enter their football programs with the NFL as their main goal, every football player that matriculates to these schools still harbor the dream of dominating their league and as a result get an opportunity to pursue their NFL dream. And it is true that NFL scouts come to FCS football games to look for talent that might have been overlooked. Many years ago I was in Hofstra’s press box, watching the Pride take on New Hampshire, with NFL scouts from the Colts and Saints there to watch WR Marques Colston play. The Saints decision to pursue Colston may very well have come from that game in Hempstead, New York. Those are the words of QB Nick Shafnisky, told to The Whitehall-Coplay Press all the way back in 2013, about his preparation as a high school athlete. And they seem to summarize the Whitehall, PA native perfectly, then as now. Dubbed the “Male Athlete of the Year” by that publication, the article goes on about Shaf’s many exploits at Whitehall high school – leading the Zephyr football team to a co-Lehigh Valley Conference title, becoming the first player ever in that conference to rush and pass for over 1,000 yards, and earning the league’s co-MVP award as well. He also was a member of the Zephyrs playoff basketball team, and for good measure also helped set a record for the 4×100 relay team as well. At Whitehall, and at Lehigh, coaches pushed him, but it was his own hard work that helped make him the best athlete he could be. This weekend, Shaf, like every eligible college football player, will be hoping that he hears his name called in the NFL Draft somewhere, whatever day, whatever round. If his name isn’t called, he’ll be hoping to get a call from an NFL team to get signed for a training camp. One thing he won’t do, however, is stop pushing. There have been many football offseasons when I’ve covered the possibility of one, or perhaps two, Patriot League players getting signed as free agents playing at the next level. This offseason, we might see something unprecedented. 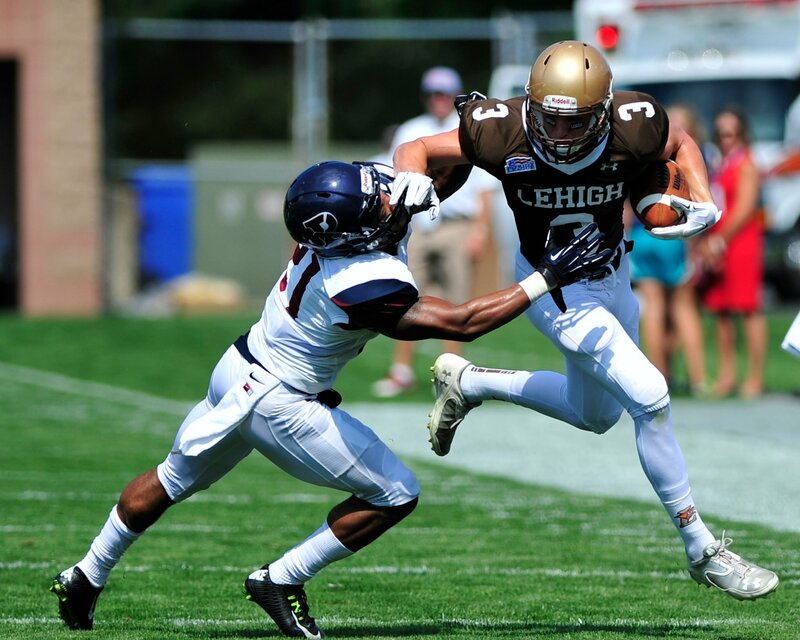 Four Lehigh football players – QB Mike Colvin, TE Jamel Haggins, LB Billy Boyko, and, of course, WR Ryan Spadola – all have an excellent chance at finding themselves in NFL training camps in the next couple of months. One – Spadola – is a strong candidate for being drafted this Saturday. When you are looking to make the NFL, every moment, and every all-star game and combine, matters. This past week, former Lehigh star WR Ryan Spadola, who is currently looking to be one of those guys that play on Sundays, looked to make every moment of his appearance in the Texas vs. The Nation All-Star game matter. That didn’t just mean the game itself, where Ryan’s stat line read 1 catch for 8 yards, a pass from Tulane QB Ryan Griffin, or the outcome, which was a 24-13 win for the (appropriately named) Nation team over Texas. It also meant the positive press in the run-up to the game, and the large number of scouts available to see their progress. In my exclusive Q&A with Ryan about his experience, I talk to him about his experience with the game, what he’s been doing, and what’s next for the Lehigh star.